An amazing tool to manage your marketing campaigns through email while presenting all the other important functions to improve the image of your company exists nowadays in the market and is popularly known as SendPulse. It has many appealing functions like the one it was originally built for–to manage the complete campaign via emails. With regards to it, the tool is quite pleasant and intuitive, and at the same time, quite easy to use. It allows you to give a creative, attractive touch to the images of your email by using its simple email template editor and various responsive email templates. 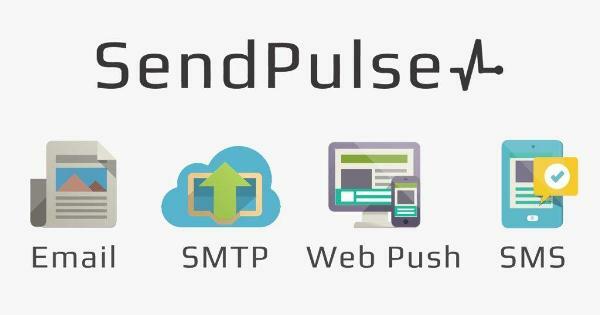 Another important function offered by SendPulse is its ability to be your SMTP server too. It allows the integration of multiple systems on one platform and helps you send emails consisting of transactions. Besides, it can be used in marketing with the help of any integrated apps or allies. Another function that is as popular as other of SendPulse is its SMS function. Most of the other tools of the same category don’t have this function. SendPulse allows you to send messages to your customer containing information relevant to them. Anything ranging from offers to special discounts can be sent out to the customers in the form of an SMS. This functionality gives SendPulse an advantage over other tools of its kind. Managing email list is a basic feature available in all the existing tools. 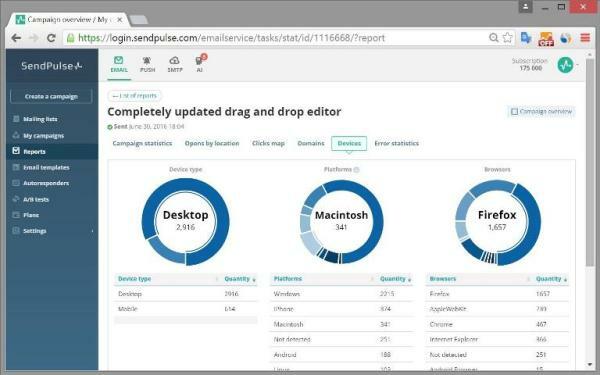 However, SendPulse offers a clean and simple user interface for you to remove or add emails out of your email list. Using SendPulse enables you to import a complete list from different file formats like XLS, XLSX, and CSV. Additionally, you can add email list from all the platforms you are running your business on, then be it Zapier, WooCommerce, or Bitrix24. Moreover, you can export the email lists from many email marketing services existing on the internet like UniSender, GetResponse or MailChimp. Creating email campaigns is much easier in SendPulse than all other of its kind. The simple process incorporates adding the mailing roll in the address book, and then your name, subject line, and email. Chances are that you won’t find the correlative mailing campaign interface in contrast to the other email service providers; however, their special occasion catalog on days like Cyber Monday and Black Friday are amazingly good. As soon as you select the sample, it will bring you the HTML editor, which is even easier and more interactive to work on. It is probably the best I found so far in the email marketing tools. Its reporting feature makes up for the best of all functionalities. All the campaign reports are vibrant, fresh, graphical and quite interactive. You can relate to them easily. The reports collect data like sent emails, spams, opened-and closed-emails, and clicked emails. All the reporting is probably normal but the presentation and the easy understandability is what we all looking for. This all about SendPulse best features for your next email marketing campaign. This is probably one of the greatest tools for creating an email campaign for your business. It offers many reasonable plans anyone can afford. Also, it offers a free account in which you get to send a particular amount of emails to your customers. While offering high rates of deliverability, it also is fully functional and comes at a very decent price. What’s your thought on this? I like that it has the sms function too! This is something different from other tools. And it helps you to understand the data clearly. Will sign up for the free account to check it out.